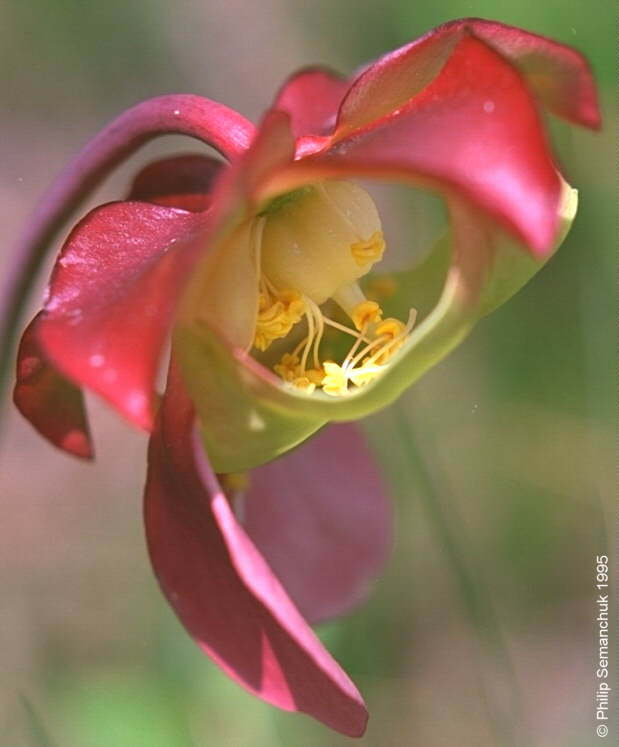 The flower of Sarracenia pupurea in the Green Swamp near Wilmington, NC, USA, April 28, 1995. The parent plant was getting strong competition from tall grasses and was growing in partial shade. The soil was damp to the touch and was typical of the acidic sand/peat mix found in the swamp. I like this photo; the fact that the flower is waning allows you to see all the parts of the flower clearly. One red petal has fallen conveniently aside to expose the flower's reproductive organs, and the breeze conveniently stopped blowing just long enough for me to take this picture. I took this photo with a Minolta Maxxum 7000 and an inexpensive set of macro lenses on Fuji 100 film. The negative was scanned directly onto a Kodak Photo CD. Copyright 1995 by Philip Semanchuk. The photograph may be downloaded for private use and may be used by the ICPS or The Nature Conservancy provided proper credit is given. The photograph may not be used commercially or for publications without permission from Philip Semanchuk (bonz@nando.net).